My story, Radical Abundance, will be published on the Metaphorosis site next week, but this week my nano-interview (that’s an interview with one question, by the way, and it’s also a term I just made up) was published on the site recently. If you like science fiction and fantasy short stories, be sure to check out the Metaphorosis site. They’ll send a link to a short story every week if you sign up, and the stories I’ve read so far are pretty great. And if you are writing short speculative fiction, consider submitting to Metaphorosis. The editor, B.Morris Allen, was a pleasure to work with while editing my story. And he gets back to authors of submitted fiction really quickly. Designing our corn maze every is one of the parts I enjoy most about running our seasonal agritourism business. I spend about a week thinking about the intersections of art and math and science, and mixing in whatever I find interesting–because if it’s interesting to me, I can convey that to our staff, and our staff can engage our customers in conversation about the maze theme. This year, the University of Wisconsin Geology Museum contacted me and suggested doing a trilobite corn maze. I’ve never partnered with anyone for our corn maze design, but Rich and Brooke were very persuasive. They are both full of ideas and are ridiculously enthusiastic about making science interesting to everyone. Initially I was skeptical about making the main figure a trilobite because I figured many people would have no idea what it was. However, I eventually realized that it looked like a big ugly bug, and that worked just fine as well. It’s funny how things work out. Trilobites work fine as bugs, and the path to Science passes through a maze of corn. I remember the very first time I saw a computer-generated image that actually looked awesome. It was in Scientific American, I think, probably in the late 1980’s, and it was a scene with a simple sphere and a single light source. The article discussed the “ray-tracing” software, a mind-blowing concept at the time. I think it took like a million hours to render the image–and it was AMAZING. Fast-forward to the future, which we now live in. My son and I have been taking a class at Madison College to learn Blender, which is an incredibly robust open source 3D design software. We are going to make some projects to send off to be 3D printed at Shapeways, but Blender can also be used for animation and all kinds of 3D projects. 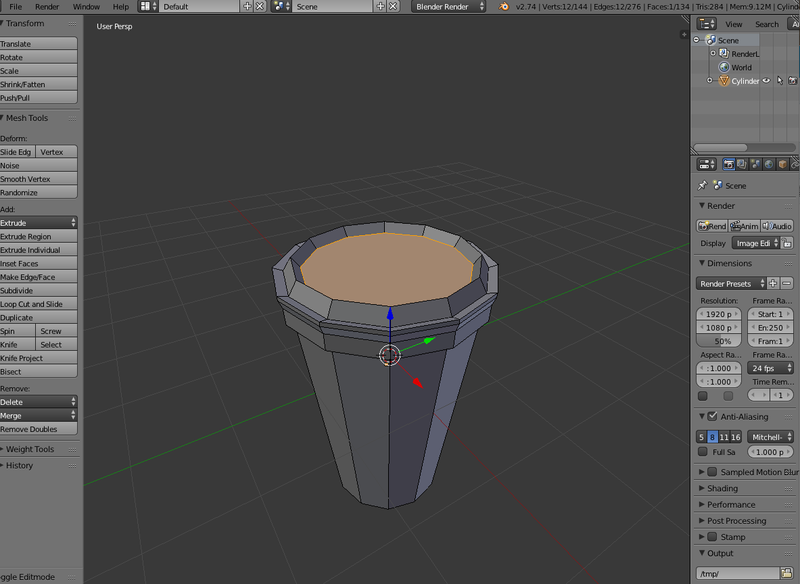 Look, I made a coffee cup! I love living in the future! Actual quote from Scientific American publication that arrived at my house later that same day…. “Anyone showing up at the airport with bad intentions is unlikely to comport himself like he’s spending the day at the beach. At the minimum, he’ll be furtive and evince some measure of edginess—even if subtle and subconscious. And this is where California-based Eyeris’s micro-expression recognition software, EmoVu, comes in. Interfaced with a color or 3-D time-of-flight camera overlooking an airport terminal, EmoVu’s self-learning algorithms register even the subtlest facial cues—lasting just 1/20th of a second—that correspond to a suite of universal human emotions: joy, surprise, anger, sadness, fear, disgust, neutral. To put this into perspective, the human eye only recognizes macro-expressions, such as a smile or grimace, which usually last just 0.5 to 4 seconds. Such performance is largely determined by how many frames per second (fps) a visual device can capture, with the human eye topping out at about 5 fps, and EmoVu processing images at 140 fps. In addition, the human brain needs several seconds to register what the eye is seeing, but EmoVu’s “brain” does so almost instantaneously. In practice, EmoVu functions like so: 12:05 pm, three people in field of view, 1 male—distressed, 2 females—happy. If programmed accordingly, it can then dispatch a security alert when certain affective criteria are crossed. Eyeris’s CEO, Modar (JR) Alaoui, claims that his software consistently boasts an astounding 96.8% accuracy on account of its self-correcting and deep-learning artificial intelligence, which makes it more accurate at interpreting facial cues as it collects more data. In other words, the longer the technology operates, the more formidable it becomes. …at least, they are for me right now, as I’m having the intensely pleasurable experience of introducing my son to the great science fiction that I grew up with, and recommending good current fiction as well. My Aspergian son reads well but slowly, so he’s not able to get through the sheer number of books I did at his age (plus, I never had to deal with the siren song of the digital world.) He often listens to recorded books (thank you, Audible subscription) but I still have to make recommendations knowing that he won’t read as many books. So, where do you start? Start in the Golden Age and work your way up? Start now and go back? I also homeschool him for his core classes, including English and Social Studies, so a few novels made their way in under the guise of assigned reading. Last year, he read Little Brother by Cory Doctorow at the same time we were following the Edward Snowden situation, so that was a huge success (my son is feverishly reading Homeland right now.) We also started listening to 1984 on a car ride recently, and maybe it was the narrator, but we were both super creeped out by descriptions of the Ministries in the beginning, especially the Ministry of Love–I’d forgotten how great George Orwell’s prose is. So my son’s getting quite a dose of dystopian fiction–I’ll need to bring in a broader view of science fiction and fantasy. For sure more Heinlein, some Asimov and Clarke. Plus John Scalzi, Neal Stephenson, Iain Banks, Stephen King…LOTR! Narnia!!! Any ideas? If you could read only ten books EVER again, what would they be? Or, if you were designing a high school curriculum around science fiction, how would that look? 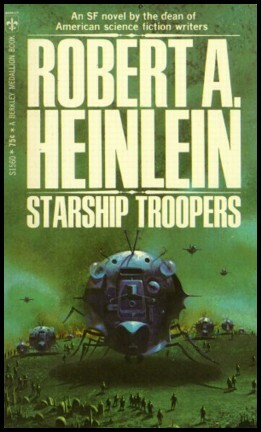 This was the cover of my copy of Starship Troopers, from when I first read it in the late seventies or very early eighties. I had to get a new copy for my son because this one sadly fell apart when I tried to read it. The first time the feds came for me at school, I’d been pretty freaked out—probably the effect they were going for when they read me my rights in the principal’s office. I was only ten, so sobbing was probably a reasonable reaction under the circumstances. Still, later, I was a little disappointed in myself. The second time, I saw the black car with government plates pull up, and so I had time to put on a convincingly innocent and confused face while remaining calm. Same agents, same black suits and ties. Same questions for me. Same angry mother having to leave work to deal with her delinquent son. This time, though, I could tell things were going to go down differently. For one thing, I wasn’t expecting them—I hadn’t been technically breaking the law in my online activities in some time. So, when the speaker broke into my English class and requested my presence in the office, I had this idea that it was about my science fair award. I knew I was going to win–when your project has to do with self-assembling nanobot swarms, it stands out from the usual middle school displays on how bean plants grow better when you talk to them. I was mentally rehearsing how humble and surprised I’d be, but as I turned the corner I practically ran into my two personal federal agents. They gave me the usual death glare. Two other guys were with them. 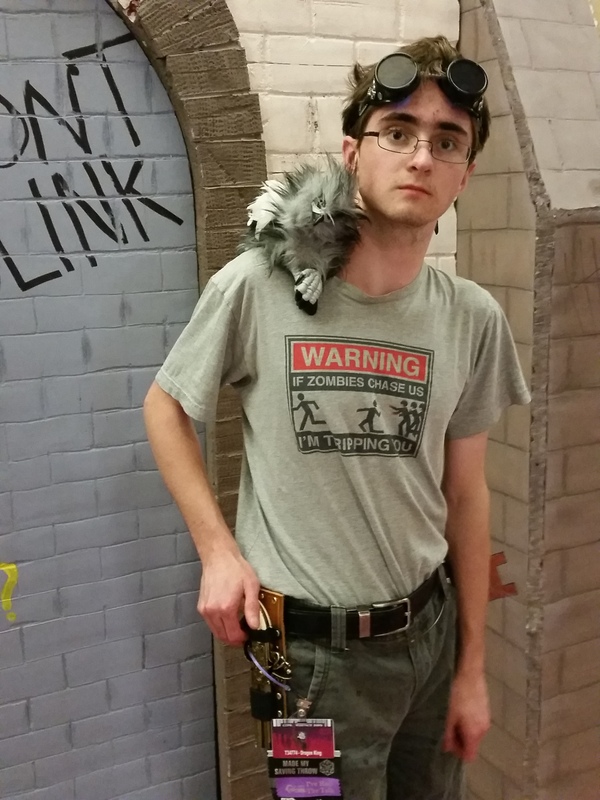 One guy had a t-shirt with digits of pi arranged in fractal swirls, and the other one’s shirt had a Tardis from Dr.Who. Both had a little scruffy beard growth, and they were very clearly not federal agents. I knew them—not them, personally, but the kinds of guys they were. Engineers or programmers or someone who actually knew what they were doing in the digital realm. The feds had brought along guys like me. And that meant that this time, they might actually figure out what I’d been up to. This is compelling because we have the Feds coming after a teenager, and he admits he’s been up to something they are interested in. This feels big in scope. It’s also well-written; the flow is excellent. In addition, this is clean of typos or mistakes in punctuation, etc. This is a pro writer deserving of attention from any agent or editor or reader. From my hotel room window I can see the cheerful stick-figure WALK Guy, and the serious, no-messing-around DO NOT WALK hand. I’ve been bored, so I’ve timed them by counting in my head: forbidding red hand for thirty seconds, happy WALK guy for twenty. The real people walking do not look cheerful or happy like WALK guy, though. It has been raining and snowing, and with the subways and trains all shut down, most people just walk in the slush. But they have to be careful, because the people who are driving aren’t always watching for pedestrians. I’ve seen five people hit while I’ve been in the hotel. People have forgotten, my mom says. It’s been a while since people thought of cars as something that could kill you, and I guess even if you know that it’s just people driving them now, it’s easy to forget and step in front of them when WALK Guy says to. I wonder if autonomous vehicles are banned in other countries, too, and for about the ten-thousandth time, I reach for my phone before I remember it’s gone. Phones were the first thing that the Relinquishment Regulations targeted. Not that my phone would do any good, because the internet came apart (or was dismantled, depending on who you talk to) right about the same time. And then the electrical grid went down, and although we’ve got power now it’s iffy. The WALK guy sometimes goes dark and motionless and the cars and pedestrians become a mass of slowly twirling eddies on the pavement. From above it reminds me of swirls of milk in hot chocolate. Thinking about hot chocolate that reminds me of our kitchen at home, and that place is gone now. Just a smear of radioactive rocks, probably, although my mom says it wasn’t a nuke, just a regular missile. Even they wouldn’t have used a nuclear weapon against U.S. citizens, she says, but anyone we talked to said that they’d heard it was a nuke. This is clever! It feels fresh with the character making something of “WALK Guy” and “DO NOT WALK hand”. We’re told right away that this very observant character has also seen five people hit by traffic while he’s been at the hotel. And then we find out that phones have been banned by the Relinquishment Regulations! Any young person reading this is now pretty darn hooked. We also learn that their home is gone. We’re turning the page. I’m still laughing at things the main character said, and the box of pure radiation quote is my favorite. I kind of want to steal it and write a novel called A Box of Pure Radiation. I have no idea what it would be about, but it would have to be awesome if it had a title like that.